Following the successful workshop that DPA Microphones and its Indian distributor, Ansata, recently delivered in Mumbai, the two companies collaborated once again, to host a seminar in Trivandrum. The event catered to local sound engineers in the broadcast and production sectors, exploring microphone techniques and best practices with a focus on the manufacturer’s product portfolio. 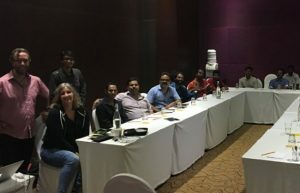 As with the Mumbai event, the Trivandrum workshop was presented by DPA’s global sales support manager, Bo Brinck, and Ansata’s pro audio division product manager, Dipanshu Mitra. The participants comprised engineers from several television networks, including Asianet, Amrita TV, Janam TV, Jai Hind TV and Mangalam TV, as well as representatives from rental companies Melody Sound and Aarabhi Recording Studio. The training covered topics such as microphone placement, mounting clips, adapters and connectors for wireless connection and transparency in the audio chain. This entry was posted in DPA Microphones, Education. Bookmark the permalink.